Discussion in 'Tohaa' started by borings, Nov 5, 2018. @borings what are your thoughts on Gao-Rael Spitfire? I don't like the Sniper option as I find little utility for it, but Spitfire option turned out to be a really decent midfield Camo flusher, assuming they have FD L1 in the current season. Thanks for pointing that out, ill append the post to include that profile. i play in philly, which doesn't have a huge scene. sure, we are the 6th biggest city in the states, but for some reason CB doesn't think we warrant a warcor, which seems to have hindered community growth. Hi, @borings. I'm your local WarCor. You might recognize me from such local events as: The league you're currently playing in, the local holiday miniature swap, the upcoming tournament on the 17th, etc. I'm very sorry that you don't feel I'm present, or are a hindrance to community growth! I'll really try to do better in the future. I know it'd be off-topic here, so feel free to hit me up on FB (the Philly FB group, or send me a DM) with any feedback or suggestions. RobertShepherd, wendigo, SN0flux and 3 others like this. ok so, i took pictures of what an average board might look like here in philly. the buildings take up a little less than 25% of the table space, and scatter terrain takes up an even smaller amount, mebbe 5%? Grathak, RobertShepherd and ijw like this. RobertShepherd, wendigo and ijw like this. I strongly recommend 'clumping' the buildings slightly - their very even distribution across the table (combined with everything but two AT43 containers being the same height) is unintentionally making life easier for your list by making most fire lanes roughly a template wide at some point. It's also going to make choosing table sides more meaningful. Leper, Thaddius, ChoTimberwolf and 1 other person like this. borings and RobertShepherd like this. Then I suggest the same thing. Apart from anything else, it's going to make for more varied games. Don't forget that the table sides should be different enough that choosing Deployment over Initiative should be a valid option. Thaddius and Leper like this. One side normally has a better sniper position/taler building. Personally I prefer a good side and a verry good side. From experience, if the buildings are clumped it actually makes deployment and advancing somewhat easier. Clumps will often make it so i only have to throw 3-4 smokes, because of the way the angles work out. Clumps on their side also means they almost definitely have their guys clumped up as well, which increases the lethality of the makaul. And with clumps it becomes easier to deploy because more safe corners are created. As for building height, ive found it only really affects the game if the buildings on the other side are taller than about 8" and they dont have ladders, and if people put all of their guys up there out of reach. If people do that it becomes much harder to cc everything, but it also makes it harder for them to get points. If they have tall buildings and a lot of camo, the game gets much harder, but still winnable. That being said, i agree there should be more variance in building height. Often we have a decent amount of crates stacked on top of those, with the smaller buildings sometimes stacked on the larger ones. Played my match on Armory, and probably should've focused more on objectives/holding the room, but It was a fun game. Opponent played Ikari in preparation for a charity tournament we have coming up. I snaked around the right side with Makauls to take out an Al Fasid in the back, losing one Makaul in the melee fight. He dropped all his Yuan Yuans, only one on my end of the table taking out two of the Kaauri (Symbiomate proxies) right in the middle. Two others took out the Makaul triad that ran up the table. Turn two i spent a few too many orders getting my Classified and couldn't pressure the room as much as I should have, so I wasn't able to get inside before Turn 3 where his fireteam picked up a light flamethrower to cover my entrance. I definitely should've rushed the room with first turn and makauls/Kaauri and held it with fear of flamethrowers but I got good practice again on the smoke tunnels. Not pictured in the image is my Clipsos sniper on the far left upper parapet. It was able to take out his Rui Shi and Evo Hacker bot on reactive 2.
i usually lose about half the makaul during turn 1. they are really just there as shock troops to cause a diversion while you get to objectives. the kaauri are pretty good at holding the armory, with them in suppressive it becomes hard to get in there reasonable. only prollem is getting more than two in there. i think learning how to make use of yer plethora of orders is the biggest hurdle, and then learning how many to spend on objectives. i think a clipsos minelayer would prolly be better for armory, but you said you weren't sure of the mission beforehand right? regardless it seems like you liked it. trading a 13 model for a 45/53 pt (not sure which fasid it was) feels pretty good right? one thing, looking at deployment it looks like you were not utilizing the kaauri to their full potential, they work a bit better when they have sightlines down the sides to aro people walking in off the table edge. also how did one yuan yuan kill two of them? lucky armor/bts saves? were they not in suppressive fire? I think a table should include both clumped sections for players that may bring warbands and a more open section for those bringing stronger long ranged ARO pieces can play. For the more exposed sections I'm not talking death lanes with no cover. The use of scatter terrain that doesn't block LOF of an S2 but provides cover will allow for meaningful plays particularly in these sections. The table looks like a similar setup to the SML table that is used at our club. It is fine though we tend to stack buildings to give variation in building height and opening up fire lanes not just from deployment to deployment but also diagonal approaches. Having said that we do have more buildings to use so are able to play around with the elevation. Stacking a few buildings may open up sections. 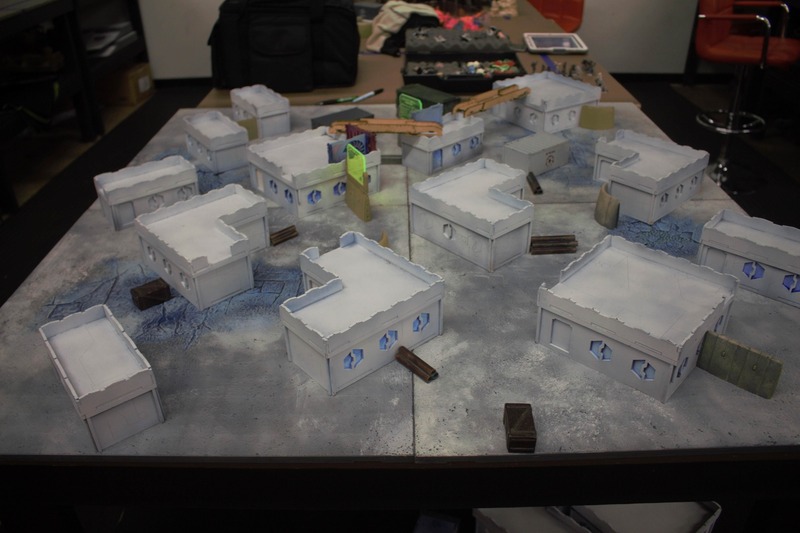 If you can fill it in with scatter terrain I think you might see a change in play experience on the board. Some very useful commentary and images @borings, thankyou. In the broader context of getting people talking about melee tohaa though, I think it's an excellent conversation and you've explained your thoughts and the list's strengths very well. Cothel and ChoTimberwolf like this. Diagonal table layout, I see you guys know what you're doing (seriously, having a square table with a square grid layout is a mistake). @borings it's fun that you came to the same conclusion with Tohaa vs JSA even with your type of list. I've started JSA end of last year and quickly realized that a lot of Tohaa's inherent strenghts (Order efficiency, Eclipse galore, multiwound models w. Mates,...) don't work against JSA. Same as you, I value CC a lot for the ridiculous damage potential, dispatching a triad in between Eclipse AROs, DTWs, them shooting back or simply making ARM saves/pulling Mates can be quite tedious. Unless you're a CC24 MA4 dude who reliably oneshots 1 artichoke per Order. Good point about the mass Kauri and mass Makaul. Adding to what you and others said, this is the same principle that makes USAriadna work. One HFT + BS11 gun is annoying, but not much of a threat. 2 are manageable. 4 enable you to find a hole in the defenses. Same for the Kaauri, I wouldn't expect one in SF to stall anything. With 4 of them being around next to Chaksa and Makaul HFTs and Smokes that's a different issue. Your opponent won't have enough troops in positions to pass several Kaauri and HFTs to get to the troops he wants to kill or the button he wants to push just like that. That's what spam does very well and 10 Order lists are incapable of achieving no matter what, board presence, overlapping close range ARO coverage and changing threats after each corner. A humble Foxtrott in positive rangebands handily outperforms a Spetznaz that can't reach the same firelane without serious Order investment. I'd call your list opportunistic with a plan. On the one hand you have the Sukeuls to clear firelanes in direct engagements, to kill the stuff your opponent throws in your face and you have to deal with sooner rather than later. On the other hand there are the Makauls preying on gaps, running and smoking across the board to do as much damage as possible. In between this many Orders and a bunch of Sensor as well as HFTs, even mass Camo should actually be quite manageable, I'm surprised you mention it as a problem. Some means of defense and an Order pool deep enough to stomach several losses are very important to have beyond the usual Sniper ARO pieces. A screen of Mines, Flashpulse bots, Warcors and expendable troops like Warbands has always higher priority for me than an obvious Sniper ARO piece that tries to lock down a corridor. Seems you're playing it the same way, have the other guy spend his orders to come to you and then struggle to chew his way through Makauls, Chaksas and Kaauri to waste some more, while at the same time willingly letting the Sukeuls die as expendable pawns, keeping the mission as only priority. Thanks for the writeup, interesting read. Thaddius, Abrilete and borings like this.